23% - That figure alone explains Amazon's goal for Fire TV. 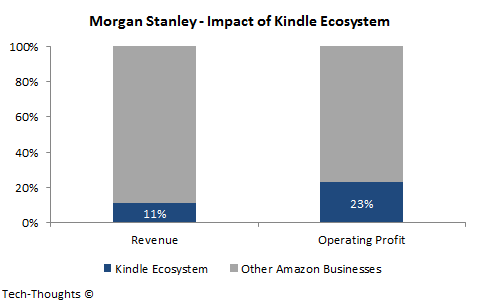 In 2013, it was estimated that the Kindle ecosystem was responsible for 11% of Amazon's revenue, but 23% of its operating profit. However, the revenue numbers also include $4.5 billion in Kindle device sales (6% of Amazon's revenue) which were sold at break-even. This means that 23% of Amazon's operating profit came from a business that accounted for just 5% of its annual revenue. Given the figures above, it is no surprise to see Amazon double down on its "razors and blades" strategy. By selling a low-cost ($99) box to consumers, Amazon gains access to a distribution channel for high-margin content sales. Amazon seems to have realized that this box would only appeal to consumers if it also provides access to third-party services like Netflix, Hulu, etc. (much like Kindle Fire tablets and third party apps). But more importantly, they also seem to be expanding their presence in the digital content business via Amazon Game Studios. As Fire TV gets the Kindle ecosystem into living rooms, games become a natural extension for their business model. After all, games are typically one of the most popular and profitable segments within this business. How is this different from Apple TV's business model? In general, Apple's business model relies on content to make their devices more attractive to consumers. Unless Apple's content offering and interaction model can be far superior to those of competitors like Fire TV, it is difficult to see device prices (and margins) improving in this category. This is why Apple TV remains a "hobby" to this day.